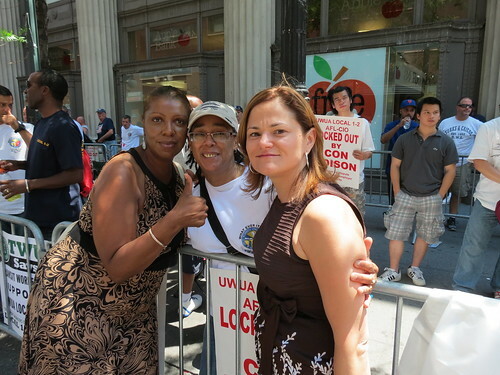 Melvin Felix Left to right: Councilmember Letitia James, union member Carol Phillips, Councilmember Melissa Mark-Viverito. A couple of hundred demonstrators today continued to protest outside of Con Ed headquarters at 4 Irving Place, where unconfirmed rumors of on-the-job heart attacks bounced between union representatives and City Council members. The Local found no published reports of the rumored death, and Con Ed did not respond to multiple messages requesting comment.